How to participate in The Scavenger Hunt? It’s Easy! Twice a week, I will post on The Crazy Bookworm asking a question. The answer will most likely require a photo, but that may not be the case for each question. If you don’t have your own camera, that’s fine. Just be creative! Maybe a Google search will help you out! You can blog, tweet, Facebook, or use whatever source you have to share your answer. 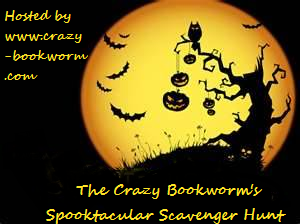 You then come back to The Crazy Bookworm and will post your response(with a link) in the Comments. Of course, I will also be participating! So be sure to stop by to check out my answers as well! Have a great question for the scavenger hunt? Feel free to Tweet me, Facebook me, or leave your question in the comments! Yes, there is a giveaway! This giveaway isn’t specifically for The Scavenger Hunt, but you will earn extra entries if you participate in The Scavenger Hunt! The Zombie Apocalypse has broken out, and you don’t have time to find weapons. You must use the object closest to you. Grab it and take a picture! It was either this, or my paperback version of The Perks of Being a Wallflower. 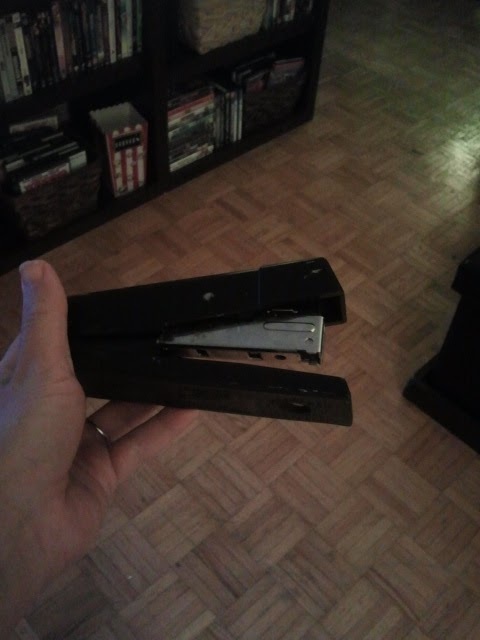 I don't know what kind of damage this would do..It doesn't even have staples!